Vaccon’s newest team member, Peter Rometti, assists the manufacturing and office teams with tasks to streamline manufacturing operations. 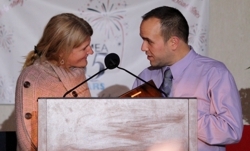 An adult with autism, Peter comes to Vaccon from HMEA of MA (HMEA), providing training and assistance for securing gainful employment to adults with disabilities. Peter is a valuable Vaccon employee, and in recognition, received the Outstanding Employee Award from HMEA in October 2016. Congratulations Peter! Peter joined Vaccon in April of 2016. He is a delightful young man who performs his tasks with dedication and good humor. He enjoys entertaining the office and manufacturing team members with his singing, and is particularly fond of Top 40 songs. In addition, Peter takes pride in showing off his mathematical talents and amazes us with his ability to instantly come up with the day of the week for any given date. Peter assists with important tasks which help reduce bottlenecks in the manufacturing process, identified during implementation of our Lean Manufacturing initiative with MassMEP. 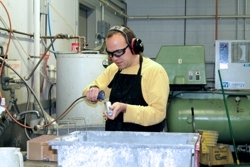 Peter’s responsibilities include product finishing processes, assembly tasks and scanning work orders into the database. 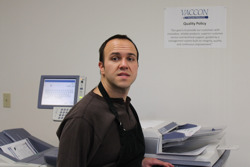 His scanning efforts are helping Vaccon with the process of going paperless for our Lean Manufacturing initiative. To learn more about HMEA, please click here.